If you're like me, you have more totes than you know what to do with. Get ready to do some closet cleaning because the Marimekko Pilvi bag is the one worth having. The Marimekko Pilvi Bag, featuring designer Maija Isola's Mansikkavouret print. Marimekko totes in (left to right) Maija Isola's Mansikkavouret print, Pentti Rinta's Lorina pattern, Isola's iconic Unikko print, Isola's Kivet print in black and white, and Kivet in red and white. The 14-inch-wide, 14.5-inch-tall, six-inch-deep bag is small enough to comfortably carry over your shoulder or hold by its handle. It also manages, however, to be big enough for all your farmers' market finds and at-the-beach necessities (we easily packed two beach towels, sunscreen, and a picnic lunch into ours). The inner, zipper pocket sets the bag apart from many other totes as it offers a safe spot to tuck your keys and wallet away (without requiring a full-on search later when you go to look for them). The top closes with a magnet in the center. The bag features designer Maija Isola's bright and bold Mansikkavouret print, designed for Marimekko in 1969. (Isola designed more than 500 prints for Marimekko, including the company's iconic Unikko textile. Watch our slideshow featuring other favorite Marimekko patterns and read our September 2011 issue story about how Marimekko's prints are made.) 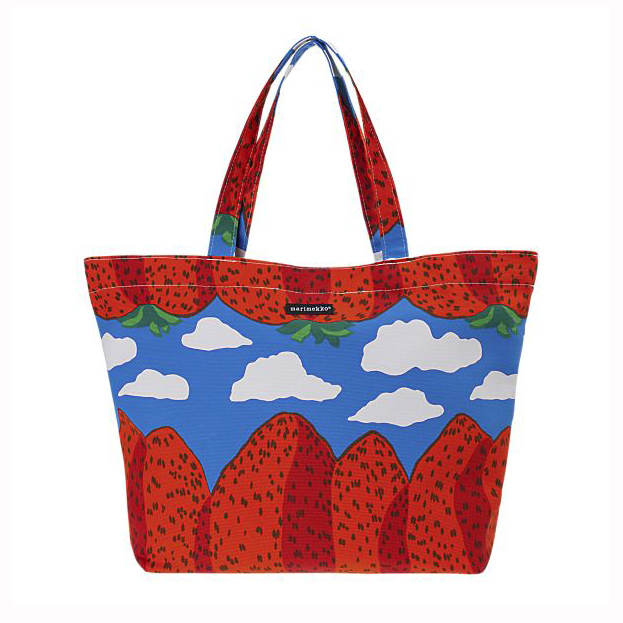 Mansikkavouret translates to "strawberry mountains" and was inspired by the Beatles' "Strawberry Fields Forever," which was released two years before the print hit the markets. The bag, and other similar designs, come in several Marimekko prints and is available at marimekko.com or crateandbarrel.com/the-marimekko-shop.